Lately, it seems that digital marketers are betting that long ads will leave a long-lasting impression. Extremely long advertisements have started showing up in a variety of digital forms. Adweek.com recently spotlighted two that rise above the rest. The first is fittingly for the highest water slide in the world called Insano located in a water park in Brazil. The Insano stands 14-stories tall and lets riders reach speeds of 65 miles per hour before plunging into a pool at the bottom. To promote this lofty structure, an email was creatively designed that reflects the terrifying feeling of plummeting down the ride. 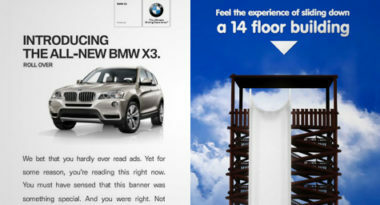 The other prime example is a banner ad created for the BMW X3 that initially looks like a basic 300-by-250-pixel box, but then expands to a whopping 18,000 pixels high to become a full 20 feet long. It’s filled with more than 5,500 words of copy that are just playful and intriguing enough to keep readers engaged. Take a look at both ads and decide whether long ads have the legs to go the distance. To discover the latest trends in online marketing, contact MDG Advertising today at 561-338-7797 or visit mdgadvertising.com. At MDG, our 360° marketing approach uses just the right mix of traditional and online marketing to reach your brand’s goals. While some industries may fare better on TV and others online, we strive to create a balanced approach where digital and traditional marketing efforts support each other and your message is tailored to the medium.